Microsoft Office 2016 products have a great new search option, Smart Lookup. 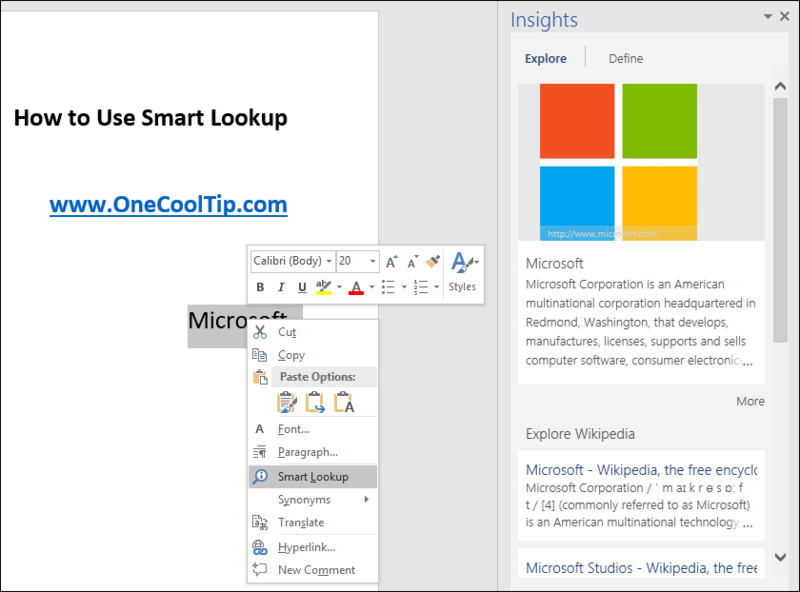 Smart Lookup is a new feature that brings the power of Bing to users within the four Office 2016 applications. Highlight search keywords and right-click to select Smart Lookup to display results in an "Insight" window within the application. You can also select the keywords and then select the "Smart Lookup" in the Review menu on the Office Ribbon. Smart Lookup is also a part of the new Tell Me feature that we shared earlier. Just enter keywords into the Tell Me box and select "Smart Lookup" from the dropdown list to display information as well.